I have not been sleeping at night the past couple weeks. My body has decided to become nocturnal. That leaves me many hours with nothing to do! Cushing's causes a loss or disruption of your circadian rhythm, so the excess cortisol at night is keeping me awake, and the lower levels during the day make me tired. I've been listening to a lot of the interviews on Cushing's Blogtalk Radio, they're all on iTunes. It's been really interesting to hear other people's stories and doctor's opinions. 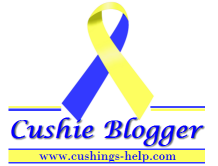 Listening to one of the interviews with Kate, who is also has Pituitary Cushing's, she brought up the idea that Cushing's patients are zebras and that makes getting a diagnosis so difficult. One of the things that people always say in medicine is when you hear hoofbeats, look for horses, not zebras. Cushing's disease is a zebra. The symptoms can be explained by any number of other conditions, including diet, lack of exercise, polycystic ovarian disease, thyroid issues...the list could go on for miles. Doctors assume that because the disease is rare, you don't have it. RARE does not mean that no one has it, it means SOMEONE has it, and why can't it be me? Many general practitioners won't see a Cushing's patient in their career. Endocrinologists might see one or 2. I have a feeling that there are FAR more people with this disease than literature estimates. I see people in grocery stores and on the street that I think look like me with round faces and centralized obesity.